2019 Gear Guide (Dec/Jan) out now! 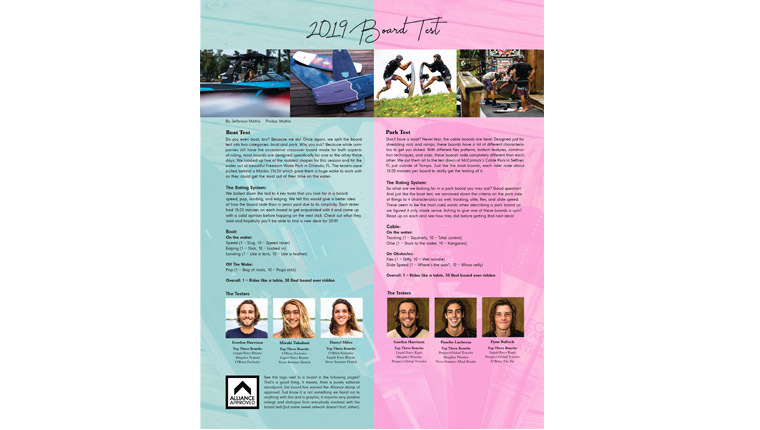 The Alliance Board Test is not only a rad time out on the water, but serves a very important purpose — to get you the most direct hands-on feedback possible about your next potential board! This year was no exception. 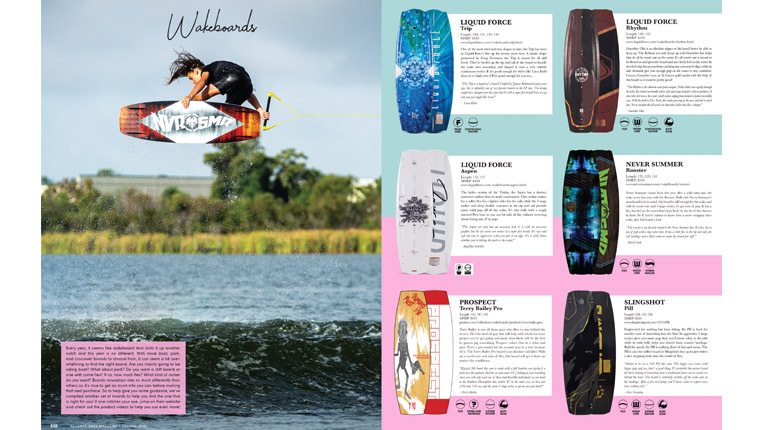 With the boat test being held out at the pristine Freedom Wake Park in Orlando and the cable test going down at McCormick’s Cable Park, we put offerings from some of the top companies to the test. Curious to know how it all went down? Well, grab a copy of the mag to see what all of our testers had to say! 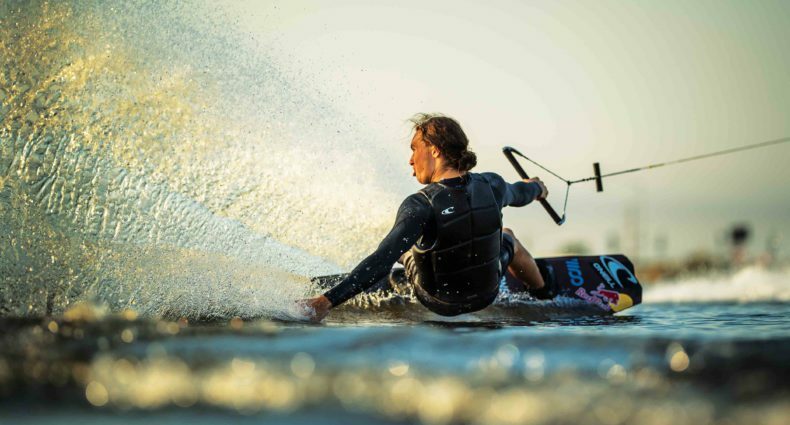 Every year, it seems like wakeboard technology takes a big step forward and this year is no different. 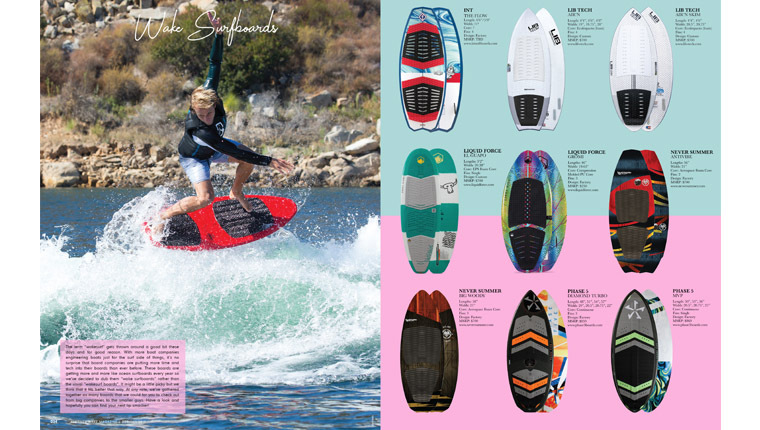 With more boat, park, and crossover boards to choose from, it can seem a bit overwhelming to find the right board. What kind of riding are you going to be doing? Do you ride boat? What about park? Do you want a stiff board or one with some flex? If so, how much flex? What kind of rocker do you like the most? Today boards typically have a very specific focus, so a flexy park board will ride really differently than a still boat board. So it’s important to get as much info as you can before making your next purchase. It’s also important to be realistic about how you ride so that you can buy the best board for you, not the one that looks just looks the coolest. So to help give you some guidance, we’ve compiled a set of boards to help you find the one that is right for you. If one catches your eye, jump on their website and check out the product videos to help you out even more. Then go to your local pro shop and see if you can demo a few. Boats are the absolute life blood of our sport. Well technically, I guess gasoline would claim that title but just roll with me on this. Without boats and their constant dedication to progression, our sport would still be in the “dark ages”. But thanks to boat manufacturers that are constantly pushing the envelope, we have the biggest wakes and waves that the sport has ever seen! In the market for a new water displacement device? We’ve rounded up the best of the best for you to check out! To round out our testing, we headed back to the boat to get pitted on as many surfers as we could! Rather than sticking around Orlando, we decided to get this done right in our Cali backyard. All the riders had a solid surfer background so we knew we’d get some pretty legit opinions. From up and comer brands to established companies, we took them all out and put them to the test. Want to know what made the cut? All the info you want is in the magazine! Ahhh yes, the Alliance OLD SCHOOL contest has always been one of our favorites. Short shorts, gloves, headbands, directional boards, bungee ski ropes, and plenty of good slams. Really, what’s not to love? After a little hiatus, we brought it back this year with a vengeance and it’s pretty safe to say that you haven’t seen the last of it! 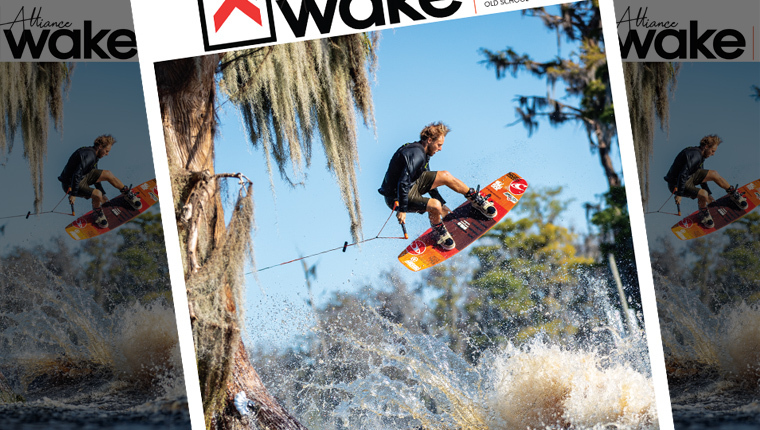 The madness is in the new mag and once you’ve soaked in all the goodness in print, get on Alliancewake.com to check out the epic recap video if you haven’t already!